Thus the no. of sides of the polygon are 11. Let the angles of the triangle be 5x, 3x and 2x. Given ∆ is right angled. 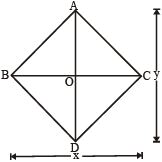 In the given figure, ∠ ABC and ∠ DEF are two angles such that BA ⊥ ED and EF ⊥ BC, then find value of ∠ ABC + ∠ DEF. In the given figure given below, E is the mid-point of AB and F is the midpoint of AD. if the area of FAEC is 13, what is the area of ABCD? As F is the mid-point of AD, CF is the median of the triangle ACD to the side AD. Hence area of the triangle FCD = area of the triangle ACF. Similarly area of triangle BCE = area of triangle ACE. = 2 Area (CFA + ACE) = 2 × 13 = 26 sq. units. ∴ θ = 180 – 3x = 180 – 3(30) = 180 – 90 = 90°. ∴ The required ratio = 90 : 120 = 3 : 4. AB ⊥ BC and BD ⊥ AC. 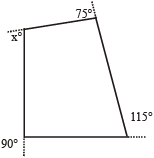 CE bisects the angle C. ∠A = 30°. Then, what is ∠CED? In a right angled ∆, the length of the median is ½ the length of the hypotenuse . 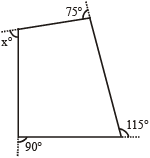 Sum of all the interior angles of a polygon taken in order is 360°. The quadrilateral obtained will always be a trapeziam as it has two lines which are always parallel to each other. In the following figure, find ∠ADC. In the figure AG = 9, AB = 12, AH = 6, Find HC. In ∆ABC, DE || BC and AD/DB = 3/5. If AC = 5.6 cm, find AE. ∴ AE = 2.1 cm. In the given fig. AB || QR, find the length of PB. 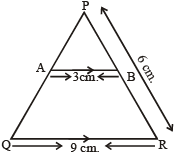 In a triangle ABC, the lengths of the sides AB, AC and BC are 3, 5 and 6 cm, respectively. 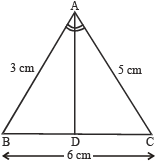 If a point D on BC is drawn such that the line AD bisects the angle A internally, then what is the length of BD?